Review on 1.M.R - Fruit Punch. I read many advertisements about 1.M.R, saying how good this product is. It is supposed to give you more evergy, focus and muscle pump. So I decided to give it a try. Everything was going fine for the first week, I felt that energy rush and the muscle pumps were noticeable. But around the middle of the second week, it lost almost all its effects. This might be because my body got use to 1.M.R too fast. But I have tried other Pre-workout supplements and this never had happen. The flavor is OK, not too pleasant but drinkable. 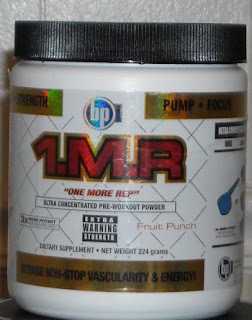 In my experience I will not get a second 1.M.R bottle after I am done with this one. It was also a little expensive = 42 dollars.